4" Long Hyper Tails, 8pk. 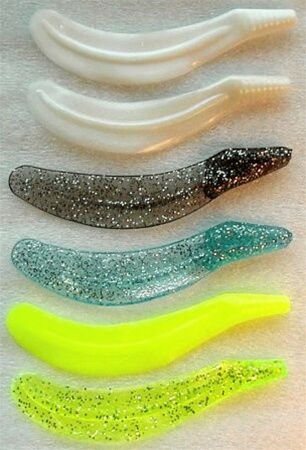 Back in the late 80's when we were about to introduce the Hyper Striper jigs we felt they had to have a good soft plastic trailer to enhance their effectiveness. Al Polston at Precision Lures suggested we check with Steve Sims from Sim's Bait who had a trailer that was originally used for barracuda. We weren't impressed when they arrived but Steve told us more than once to 'just put them in the water.' We finally did and the first time we saw that hyper action we were sold. There is no doubt that the Hyper Tails made the Hyper Striper Stump Jumper Jigs the best selling striper jigs they are today.